Lindsey Adams Buckingham was born in Palo Alto, California, and was the third and youngest child of Rutheda (née Elliott) and Morris Buckingham. He had two older brothers, Jeffrey and Gregory. Growing up in the San Francisco Bay Area community of Atherton, he attended Menlo Atherton High School where Buckingham and his brothers were encouraged to swim competitively. Though Buckingham dropped out of athletics to pursue music, his brother Gregory went on to win a silver medal at the 1968 Olympics in Mexico City. Buckingham attended San Jose State University but did not graduate. Buckingham's first forays into guitar playing took place on a toy Mickey Mouse guitar, playing along to his brother Jeff's extensive collection of 45s. Noticing his talent, Buckingham's parents bought their son a $35 Harmony guitar. Buckingham never took guitar lessons and does not read music. By age 13, he became interested in folk music and, influenced by banjo methods, practiced the energetic style of the Kingston Trio. From 1966 to 1971, Buckingham performed psychedelic and folk rock with the band The Fritz Rabyne Memorial Band in the San Francisco Bay Area as a bassist and vocalist. Shortly after joining Fritz, Buckingham invited friend Stevie Nicks to join Fritz as a second vocalist. Their romantic relationship began after both left Fritz five years later. Buckingham and his then-girlfriend Stevie Nicks recorded seven demos in 1972 on a half-inch 4-track Ampex recorder kept at his father's coffee roasting plant in Daly City, then drove to Los Angeles to pursue a record deal. In 1973, Polydor Records signed the pair. Their album, produced by Keith Olsen and second engineer Richard Dashut, Buckingham Nicks, was released in September 1973; soon after its release, however, Polydor dropped the duo because of poor sales. To help make ends meet, Buckingham toured with Don Everly's backing band, singing Phil Everly's parts. While investigating Sound City recording studio in California, Mick Fleetwood heard the song "Frozen Love" from the Buckingham Nicks album. Impressed, he asked who the guitarist was. By chance, Buckingham and Nicks were also in Sound City recording demos, and Buckingham and Fleetwood were introduced. When Bob Welch left Fleetwood Mac in December 1974, Fleetwood immediately contacted Buckingham and offered him the vacant guitar slot in his band. Buckingham told Fleetwood that he and Nicks were a team and that he didn't want to work without her. Fleetwood agreed to hire both of them, without an audition. Buckingham and Nicks then began a short tour to promote the Buckingham Nicks album. The touring band included drummers Bob Aguirre and Gary Hodges (playing simultaneously) and bassist Tom Moncrieff, who later played bass on Nicks' 1981 album Bella Donna. When they played in Alabama, the one area where they saw appreciable sales, they told their fans they had joined Fleetwood Mac. Fleetwood Mac released their eponymously titled album in 1975, which reached number one in the American charts. Buckingham contributed several songs to the album including "Monday Morning" and "I'm So Afraid" while also singing lead on "Blue Letter". I'm So Afraid and "Monday Morning" were intended for the second Buckingham Nicks LP, but they were instead used with Fleetwood Mac. Despite the success of the new line-ups first album, it was their second album, Rumours, that propelled the band to superstar status, when it became one of the best-selling albums of all time. Buckingham's "Go Your Own Way" was the lead single, soaring into the US Top Ten; also on the album were Buckingham's "Second Hand News" and "Never Going Back Again". Buckingham also sang co-lead vocal on two of the bands biggest live staples "The Chain", written by the entire band and "Don't Stop" a Christine McVie number. After the resounding commercial success of Rumours (during the making of which Buckingham and Nicks split), Buckingham was determined to avoid falling into repeating the same musical pattern. The result was Tusk (1979), a double album that Buckingham primarily directed. Once again, Buckingham wrote the lead single, the title track that peaked at #8 on Billboard Hot 100. Buckingham convinced Fleetwood to let his work on their next album be more experimental and to be allowed to work on tracks at home before bringing them to the rest of the band in the studio. It produced three hit singles: Lindsey Buckingham's "Tusk" (US No. 8), which featured the USC Trojan Marching Band, Christine McVie's "Think About Me" (US No. 20), and Stevie Nicks' 61/2 minute opus "Sara" (US No. 7). "Sara" was cut to 41/2 minutes for both the hit single and the first CD-release of the album, but the unedited version has since been restored on the 1988 greatest hits compilation, the 2004 reissue of Tusk and Fleetwood Mac's 2002 release of The Very Best of Fleetwood Mac. Original guitarist Peter Green also took part in the sessions of Tusk, although his playing on the Christine McVie track "Brown Eyes" is not credited on the album. It was during this time that Buckingham moved in with record company secretary and aspiring model Carol Ann Harris, with whom he lived until 1984. Though by most standards a hit, Tusk failed to come close to Rumours record sales, and the album was followed by a hiatus in the band's studio recording efforts. During the time he worked on Tusk, Buckingham also produced albums for Walter Egan and John Stewart in the late 1970s as well as beginning work on his own solo album. In 1981, Buckingham released his first solo album, Law and Order, playing nearly every instrument and featuring guest appearances by bandmates Mick Fleetwood and Christine McVie. The album pursued the quirky, eclectic, often lo-fi and New Wave influences of Tusk and spawned the single "Trouble" (inspired by Richard Dashut), which reached #9 on the Billboard Hot 100 and #1 in Australia (for three weeks). After a large world tour that ended in 1980, Fleetwood Mac took a year-long break before reconvening to record their next album Mirage (1982), a more pop-friendly work that returned the band to the top of the US album chart. However, by this time various members of the band were enjoying success as solo artists (particularly Nicks) and the next Fleetwood Mac album was not released until five years later. By the time Tango in the Night was released in 1987, Buckingham had already released two solo albums and had given up much of the material for what would have been his third solo album for the project, including "Big Love", "Tango in the Night ", "Family Man", "You and I" and "Caroline". On several of these tracks Buckingham played every instrument . "Big Love", released as the first single from the album, became a top ten hit in the US and the UK. In 1983 he wrote and performed the songs "Holiday Road" and "Dancin' Across the USA" for the film National Lampoon's Vacation. "Holiday Road" was released as a single, and reached #82 on Billboard's Hot 100. In 1984, after ending his 7-year relationship with Carol Ann Harris, he released his second solo album, Go Insane. The title track was a modest hit, reaching #23 on the Hot 100. In 2008, he revealed the title track was about his post-break-up relationship with Stevie Nicks; however, Harris claimed in her memoir Storms that the song was written about her breakup with Buckingham. The last track of the album, "D. W. Suite", was a tribute to the late Beach Boys drummer Dennis Wilson, a close friend of Fleetwood Mac who was briefly engaged to Christine McVie. The next year, Buckingham performed on USA for Africa's fundraising single, "We Are the World". In 1986 he co-wrote "Since You've Gone" for Belinda Carlisle's first solo album. He did other soundtrack work, including the song "Time Bomb Town" from Back to the Future (1985). Buckingham played all of the instruments on the track except drums, which were played by Michael Huey. Propelled by a string of hit singles, Tango in the Night became the band's biggest album since Rumours a decade earlier. However, following its release, Buckingham left Fleetwood Mac largely because of his desire not to tour and the strain he was feeling within the band. "I needed to get some separation from Stevie especially, because I don't think I'd ever quite gotten closure on our relationship," he said. "I needed to get on with the next phase of my creative growth and my emotional growth. When you break up with someone and then for the next 10 years you have to be around them and do for them and watch them move away from you, it's not easy." Fleetwood Mac continued without him, and Buckingham was replaced by guitarists Rick Vito and Billy Burnette. In 1992, newly elected president Bill Clinton asked Fleetwood Mac to come together to perform the song he had chosen for his campaign, the Christine McVie-penned "Don't Stop", at his inaugural ceremony. Buckingham agreed to be part of the performance, but the experience was something of a one-off for the band, who were still very much at odds with one another and had no plans to reunite officially. While assembling material for a planned fourth solo album in the mid-1990s, Buckingham contacted Mick Fleetwood for assistance on a song. Their collaboration lasted much longer than anticipated, and the two eventually decided to call upon Stevie Nicks, John and Christine McVie. The band's old chemistry was clearly still there, and plans for a reunion tour were soon in the works. In 1997, Buckingham and all four of his bandmates from the Rumours-era line-up of Fleetwood Mac went on the road for the first time together since 1982 in a reunion tour titled The Dance. The tour was hugely successful and did much to heal the damage that had been done between Buckingham and his bandmates. However, Christine McVie left the band in 1998 because of her fear of flying and to be with her family in the UK, thus making the band now a foursome. A subsequent fourth solo album, entitled Gift of Screws, was recorded between 1995–2001 and presented to Warner Bros./Reprise for release. Executives at the label managed to persuade Buckingham to hold the album back and instead take several tracks from Gift of Screws and use them with Fleetwood Mac. In 2003, the reformed band released the first studio album involving Buckingham and Nicks in 15 years, Say You Will. Buckingham's song "Peacekeeper" was the first single from the album, and the band went on a world concert tour that lasted almost a year and a half. Seven songs from Gift of Screws appear on the Fleetwood Mac album Say You Will, in substantially the same form as Buckingham had recorded them for his solo release. Bootleg copies of Gift of Screws—taken from an original CD-R presented to Warner Bros/Reprise—are known to exist and have been widely distributed among fans through the use of torrent sites and other peer-to-peer networks. On his 57th birthday, October 3, 2006, Buckingham's fourth solo album, an acoustic album now entitled Under the Skin, was released. Under The Skin features Buckingham on almost all instruments, with the exception of two tracks that feature Fleetwood Mac's rhythm section of John McVie and Mick Fleetwood. The album includes a cover of the Rolling Stones classic "I Am Waiting". Three days after the album's release, Buckingham embarked on a tour in support the album that lasted until the end of June 2007. A live album and DVD, Live at the Bass Performance Hall, was released documenting the Fort Worth, Texas show from this tour. In 2008 the Gift of Screws album was finally released, containing three tracks from the originally planned album, as well as seven new recordings. Buckingham then commenced a short tour to promote Gift of Screws in September and October, opening in Saratoga, California and closing in New York City. Fleetwood Mac toured in 2009, with the first date of the "UNLEASHED" Tour as March 1, 2009, in Mellon Arena (Pittsburgh). Christine McVie was not involved with this project. On November 3, 2010, Buckingham's website announced that he was working on an untitled album with release planned in early 2011. Buckingham had finished recording the album, titled Seeds We Sow in April, and on April 22, 2011, he filmed a concert for DVD release to support the album. Seeds We Sow was released on September 6, 2011. On September 10, Buckingham kicked off the Seeds We Sow Tour in Reno, Nevada; the tour ended in Tulsa, Oklahoma, on November 14. Buckingham had planned to conduct his first solo tour of the United Kingdom and Ireland in December. However, in early December, Buckingham postponed all UK dates due to his guitarist suffering a back injury. The UK dates were subsequently cancelled. 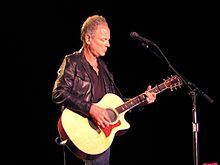 Buckingham began a "solo" (no backing band) tour of the United States on May 3, 2012, in Solana Beach, California. and in November 2012 released a completely solo live album One Man Show via download at iTunes that was recorded from a single night in Des Moines, Iowa. One Man Show was released on Buckingham's own label Buckingham Records LLC. The "Live World" tour commenced on April 4, 2013, in Columbus, Ohio. On April 30, the band released their first new studio material since 2003's Say You Will via digital download on ITunes with the four-track EP containing three new songs from Buckingham and one new song from the Buckingham Nicks sessions ("Without You"). On January 11, 2014, Mick Fleetwood announced that Christine McVie was rejoining Fleetwood Mac, and the news was confirmed on January 13 by the band's primary publicist, Liz Rosenberg. Rosenberg also stated that an official announcement regarding a new album and tour was forthcoming. On with the Show, a 33-city North American Tour opened in Minneapolis, Minnesota on September 30, 2014. A series of May–June 2015 arena dates in the United Kingdom went on sale on November 14, selling out in minutes. Additional dates for the tour were added, extending into November. In August 2016, Fleetwood said that while the band has "a huge amount of recorded music", virtually none of it features Stevie Nicks. Buckingham and Christine McVie, however, have contributed multiple songs to the new project. Fleetwood told Ultimate Classic Rock, "She [McVie] ... wrote up a storm ... She and Lindsey could probably have a mighty strong duet album if they want. In truth, I hope it will come to more than that. There really are dozens of songs. And they're really good. So we'll see." Buckingham and McVie performing live in 2017. Buckingham and Christine McVie announced a new album titled Lindsey Buckingham Christine McVie, which also features Mick Fleetwood and John McVie. The album was originally planned as a Fleetwood Mac album. Stevie Nicks did not participate due to her preference for a solo tour with The Pretenders. Lindsey Buckingham/Christine McVie was released on June 9, 2017, and was preceded by the single, "In My World". A 38-date tour began on June 21, 2017 and ended on November 16. Fleetwood Mac headlined the second night of the Classic West concert (on July 16, 2017 at Dodger Stadium in Los Angeles) and the second night of the Classic East concert (at New York's Citi Field on July 30, 2017). Following Fleetwood Mac's performance at the MusiCares Person of the Year in January 2018 Buckingham was fired from Fleetwood Mac The reason was said to have been a disagreement about the nature of the tour, and in particular the question of whether newer or less well-known material would be included, as Buckingham wanted. Mick Fleetwood and the band appeared on CBS This Morning on 25 April 2018 and said that Buckingham would not sign off on a tour that the group had been planning for a year and a half and they had reached a "huge impasse" and "hit a brick wall". When asked if Buckingham had been fired, he said, "Well, we don't use that word because I think it's ugly." He also said that "Lindsey has huge amounts of respect and kudos to [sic] what he's done within the ranks of Fleetwood Mac and always will." In October 2018, Buckingham filed a lawsuit against Fleetwood Mac for breach of fiduciary duty, breach of oral contract and intentional interference with prospective economic advantage, among other charges; the lawsuit was settled in December of the same year. Buckingham stated he learned about the firing after receiving a call from Fleetwood Mac manager Irving Azoff with a message for Buckingham from Stevie Nicks. Buckingham stated that Azoff told him: "Stevie never wants to be on a stage with you again." According to Azoff, Nicks had taken issue with, on the evening of MusicCares, the guitarist's outburst just before the band's set over the intro music—the studio recording of Nicks' "Rhiannon"—and the way he "smirked" during Nicks' thank-you speech. Buckingham conceded that "It wasn't about it being 'Rhiannon,' It just undermined the impact of our entrance. That's me being very specific about the right and wrong way to do something." Days later Buckingham called Azoff and asked if "Stevie was leaving the band, or if he was getting kicked out?" Azoff told the guitarist he was "getting ousted" and that Nicks gave the rest of the band "an ultimatum: Either you go or she's gonna go." to which they decided to fire him. Former Tom Petty and the Heartbreakers guitarist Mike Campbell and Neil Finn of Crowded House were named to replace Buckingham. Buckingham has stated since he would be open to rejoining Fleetwood Mac but does not foresee it in the future. In August 2018, Reprise issued a press release for a new solo anthology Solo Anthology: The Best of Lindsey Buckingham that focuses on Lindsey's solo career since 1981. The anthology was released on October 5, 2018 and was followed two days later by a solo tour throughout North America. Buckingham underwent emergency open heart surgery in February 2019. His wife Kristen Buckingham said that "Late last week Lindsey Buckingham experienced severe chest pains and was taken to the hospital where he subsequently underwent emergency open heart surgery. It’s with great relief and thankful hearts that we report the surgery was successful in its purpose. Unfortunately, the life-saving procedure caused vocal cord damage, the permanency of which is unclear. Lindsey is slowly recovering at home with the support of his wife and children." Unlike most rock guitarists, Buckingham does not play with a pick; instead, he picks the strings with his fingers and fingernails. Initially after joining Fleetwood Mac, Buckingham used a Gibson Les Paul Custom. Before the band, a Fender Telecaster was his main guitar, and was used on his first Fleetwood Mac album alongside Fender Stratocasters fitted with an Alembic Blaster. In 1979, he worked with Rick Turner, owner of Renaissance Guitars to create the Model One. He has used it extensively since, both with Fleetwood Mac and for his solo efforts. He uses a Taylor Guitar 814ce for most of his acoustic performances but uses a custom made Gibson Chet Atkins guitar for his live performances of 'Big Love'. He has also used an Ovation Balladeer in the past from the early 1970s to the late 1980s. In the 1980s, he also extensively used the Fairlight CMI. His influences include Brian Wilson and Phil Spector. Buckingham has also worked extensively as a producer both for Fleetwood Mac and for his solo work. "I think of myself as a stylist, and the process of writing a song is part and parcel with putting it together in the studio." I've always believed that you play to highlight the song, not to highlight the player. The song is all that matters. There are two ways you can choose to go. You can try to be someone like Eddie Van Halen, who is a great guitarist, a virtuoso. Yet he doesn't make good records because what he plays is totally lost in the context of this band's music. Then there are guitar players like Chet Atkins, who weren't out there trying to show themselves off as guitarists per se, but were using the guitar as a tool to make good records. I remember loving Chet's work when I was a kid, but it was only later, when I really listened to his guitar parts, that I realized how much they were a part of the song's fabric, and how much you'd be going 'Oh, that song just isn't working' if they weren't there. Well, it's not really a choice at all. It's just, you know, I started playing very young and from early on, the people I was listening to had some element of finger style. Probably the first guitarist I was emulating was Scotty Moore, when I was maybe 6 or 7. And he played with a pick, but he also used fingers. And a lot of the session players, like Chet Atkins, they played with fingers or a pick. Then I listened to a certain amount of light classical guitar playing. And of course later on, when the first wave of rock 'n' roll kind of fell away, folk music was very popular and very influential in my style. So it was really less of a choice than what I fell into. I use a pick occasionally. I certainly use it more in the studio when you want to get a certain tone. But it's just the way I came up. I wasn't taught. I just sort of figured things out on my own terms. I guess that was one of the ways that I became comfortable and it just kind of set in. Buckingham has been portrayed by Bill Hader in a recurring sketch titled "What Up with That" on NBC's Saturday Night Live. He appeared as himself on the May 14, 2011 episode during this sketch. Buckingham plays himself and sings in episode 3 of the Showtime series Roadies. 1973 Buckingham Nicks - - - - Debut album featuring duo of Buckingham and partner Stevie Nicks. Both later joined Fleetwood Mac, after this album failed commercially and label Polydor dropped them as they were recording tracks for follow-up album. The album started out as Fleetwood Mac's 18th studio album. Buckingham and Christine McVie decided to make it a new project after Stevie Nicks refused to join the rest of the group for the album's creation. Nicks instead launched a solo arena tour with The Pretenders. 1981 – "It Was I"
1993 – "Don't Look Down"
2006 – "Show You How"
2006 – "It Was You"
2006 – "Shut Us Down"
↑ Greene, Andy (2018-04-09). "Fleetwood Mac Fires Lindsey Buckingham". Rolling Stone. Retrieved 2018-12-07. ↑ "Kristen Buckingham". Twitter. Retrieved February 8, 2019. ↑ "Lindsey Adams Buckingham, Born 10/03/1949 in California". Californiabirthindex.org. ↑ "Morris Buckingham – Historical records and family trees". Myheritage.com. ↑ Howe, Zoë (October 13, 2014). "Stevie Nicks: Visions, Dreams and Rumours". Omnibus Press – via Google Books. ↑ Schruers, Fred (October 30, 1997). "Fleetwood Mac: Back on the Chain Gang". Rolling Stone. ↑ Phil Sutcliffe. "Take it to the Limit". Rockalittle.com. 1 2 Adelson, Martin E. "Lindsey Buckingham". Fleetwoodmac.net. ↑ "Fleetwood Mac • Lindsey Buckingham • The Band • The Music • The Legacy". Fleetwoodmac.org. Retrieved February 29, 2012. ↑ Adelson, Martin E. "Javier Pacheco Question and Answer Session". Fleetwoodmac.net. ↑ Adelson, Martin E. "Fritz". Fleetwoodmac.net. ↑ "Fritz". The Penguin Biographies. Martin Adelson and Lisa Adelson. Retrieved May 24, 2014. ↑ Jackson, Blair (February 1, 2011). "Music: Lindsey Buckingham in Two Worlds". Mix. When I was about 21 some relative I didn't even know left me something like $10,000, so one of the things I did with that money was go out and buy an old Ampex half-inch 4-track—like the kind they recoded Sgt. Pepper's on, I guess. At that time, my dad had this small coffee plant in Daly City [south of San Francisco]—they were coffee roasters—and at night I would go up there with Stevie, and a lot of times just by myself, and work on songs and demos. ↑ "Q&A; with Lindsey Buckingham". Web.archive.org. Archived from the original on September 5, 2012. Retrieved June 14, 2017. ↑ Fleetwood, Mick; Bozza, Anthony (October 2014). Play On: Now, Then & Fleetwood Mac. 1290 Avenue of the Americas, New York, NY, 10104: Little, Brown And Company. pp. 164, 169. ISBN 978-0-316-40342-9. ↑ "Madness Fades – Lindsey Buckingham, In His Words". Web. archive.org. September 22, 2007. Archived from the original on September 22, 2007. Retrieved February 29, 2012. ↑ "The Blue Letter Archives". Bla.fleetwoodmac.net. Retrieved August 18, 2016. ↑ Greg Kot (June 14, 1992). "This Mac Is Back – Page 2". Chicago Tribune. Retrieved August 18, 2016. ↑ "Stevie Nicks Reveals Why Christine McVie Really Left Fleetwood Mac". Yahoo. The Insider. November 20, 2014. Retrieved February 21, 2016. ↑ "The 2006–2007 Lindsey Shows". Fmlegacy.com. Archived from the original on February 25, 2012. Retrieved February 29, 2012. ↑ "Reuters Press Release". Reuters.com. February 5, 2008. Archived from the original on November 18, 2009. Retrieved February 29, 2012. ↑ "The 2008 Lindsey Shows". Fleetwoodmac-uk.com. Retrieved February 29, 2012. ↑ "Home". Lindsey Buckingham. Retrieved February 29, 2012. ↑ Dean Goodman (April 12, 2011). "Lindsey Buckingham gearing up for new album, tour". Reuters. Retrieved December 11, 2011. ↑ "UK Tour Dates Postponed". Lindsey Buckingham. Retrieved February 29, 2012. ↑ "LINDSEY TAKING HIS SOLO ACT ON THE ROAD STARTING MAY 3 IN SOLANA BEACH, CA". Lindsey Buckingham. Retrieved February 15, 2013. ↑ "Still Going Insane . A Lindsey Buckingham Resource". Fleetwoodmac-uk.com. December 3, 2012. Retrieved February 15, 2013. ↑ "Mick Fleetwood Announces Christine McVie's return to Fleetwood Mac". Fleetwood Mac News. January 12, 2014. Retrieved February 12, 2014. ↑ "Christine McVie Rejoins Fleetwood Mac: Official". Billboard. January 13, 2014. ↑ Fleetwood Mac: new album and tour will be our swansong, The Guardian (London), January 2, 2015, Retrieved May 19, 2015. ↑ Fleetwood Mac album may take 'a couple of years' to finish, The Guardian (London), March 10, 2015, Retrieved May 19, 2015. ↑ DeRiso, Nick. "Fleetwood Mac's New Album Is Apparently Being Held Up by Stevie Nicks". Ultimate Classic Rock. Retrieved September 5, 2016. ↑ Yoo, Noah. "Fleetwood Mac's Lindsey Buckingham and Christine McVie Announce New Duets Album". Pitchfork. Retrieved January 13, 2017. ↑ Blistein, Jon. "Fleetwood Mac's Lindsey Buckingham, Christine McVie Detail New Album". Rolling Stone. Retrieved April 11, 2017. ↑ "Mick Fleetwood: Stevie Nicks Wants To Go Deep On Next Fleetwood Mac Tour". 94.7 WLS. Retrieved August 31, 2017. ↑ "Fleetwood Mac Reveals Why Lindsey Buckingham was ousted". CBS This Morning. 25 April 2018. ↑ Greene, Andy (11 October 2018). "Lindsey Buckingham Sues Fleetwood Mac Over Dismissal From Band". Rolling Stone. Retrieved 12 October 2018. ↑ "Solo Anthology Press Release". Reprise Records. ↑ "Lindsey Buckingham Recovering From Open Heart Surgery". Pitchfork. Retrieved February 17, 2019. ↑ "MWE3 Features". Mwe3.com. January 12, 1998. Retrieved August 18, 2016. ↑ Inc., Equipboard. "Lindsey Buckingham's Gibson Chet Atkins CE". Equipboard. ↑ "Interview: Lindsey Buckingham Discusses Turner Guitars and His New Album, 'Seeds We Sow'". Guitarworld.com. ↑ Graham, Sam. "Lindsey Buckingham: Personal Brinksmanship and State-of-the-Art Subconscious". The Blue Letter Archives. The Penguin. Retrieved April 12, 2015. ↑ Romano, Will. "Let The Right Sounds In: Fleetwood Mac's Studio Genius Opens Up About His Off-Kilter Production Techniques". Electronic Musician. Retrieved February 21, 2017. ↑ "Rolling Thunder by Askold Buk in 90's Guitar World Acoustic edition". pt. scribd.com. May 16, 2012. Archived from the original on July 29, 2013. Retrieved February 29, 2012. ↑ "Interview: Lindsey Buckingham Discusses Turner Guitars and His New Album, 'Seeds We Sow'". www. guitarworld.com. September 21, 2012. Retrieved September 22, 2012. ↑ Navaroli, Joel. "SNL Archives – Episodes – Details". The SNL Archives. Retrieved February 10, 2014. ↑ "Roadies: Roadies: Lindsey Buckingham "Bleed to Love Her" | SHOWTIME". Sho.com. June 27, 2016. Retrieved June 14, 2017. 1 2 "LINDSEY BUCKINGHAM | full Official Chart History | Official Charts Company". Officialcharts.com. Retrieved August 18, 2016. ↑ "RPM Top Albums/CDs". Library and Archives Canada. Canada.ca. Retrieved April 27, 2016. ↑ "Sverigetopplistan – Sveriges Officiella Topplista". Sverigetopplistan. Retrieved June 16, 2017. Click on "Veckans albumlista". ↑ "On The Charts: June 19, 2017". FYIMusicNews. Retrieved June 19, 2017. ↑ "RIAA Gold and Platinum Search for albums by Fleetwood Mac". Riaa.com. Retrieved February 29, 2012. ↑ "RPM 50 Singles – Dec. 26, 1981". Library and Archives. Canada.ca. Retrieved April 27, 2016. Buckingham, Lindsey (September 3, 2003). "A conversation with musician Lindsey Buckingham; Reuniting with Fleetwood Mac and their recording "Say You Will"". Charlie Rose (Interview). Interviewed by Charlie Rose. New York: WNET. Archived from the original on March 26, 2010. Retrieved January 8, 2011.